Our off-grid 4500W kit is a triple hit because it combines three of the worlds best top brands; OutBack FLEXpower Two fully pre-wired dual inverter system, MidNite Solar lighting arrestor and Canadian Solar panels. Methodically engineered, every component of this kit has been specially selected to assure the highest performance in a safe and simple-to-install kit. This mini-grid power system is ideal for applications such as off-grid cabins, home or business back-up power systems. Utilizing a compact design and an easy-to-install mounting bracket, the fully pre-wired and tested OutBack FLEXpower FP2 power center is designed for a quick and simple installation saving both time and money with just a few household tools. 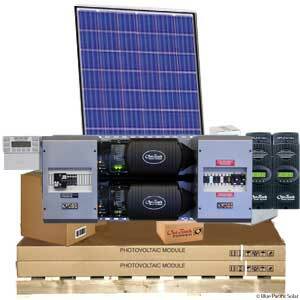 Select the right size off-grid kit for you in with the FLEXpower in either a 24 or 48 volt battery system. This Outback 4500W FP2 Off-Grid Kit is expandable, and accommodates all of the essential protective devices in the smallest possible space making it ideal for applications with modest power requirements such as cabins, chalets, homes, remote communication sites and back-up power systems. Utilizing an extremely compact design and an easy-to-install mounting bracket, the fully pre-wired and factory tested FLEXpower Two system is designed for a quick installation. Choose either roof, ground or pole mount rack which will save you both time and money. As with all Blue Pacific Solar's kits, our Technical Sales staff is standing by to provide support that is as close as your telephone. Outback 4500W FP2 Off-Grid Kit is a superior choice when you need a fully integrated, true sinewave, reliable 120V/240V power system. OutBack Warranty 5 Years, Solar Panel Warranty 25 Years. 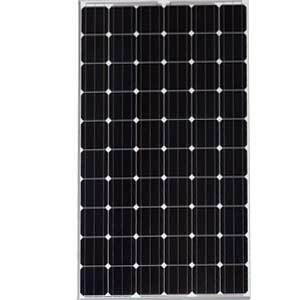 Outback 4500W FP2 Off-Grid Kit is a solid-state electronic devices that, when sized properly, can be used in nearly every solar and wind energy system that uses batteries. This Outback 4500W FP2 Off-Grid Kit is an affordable expandable do-it-yourself (DIY) high quality solution for your home, cabin, workshop or backup power requirements.